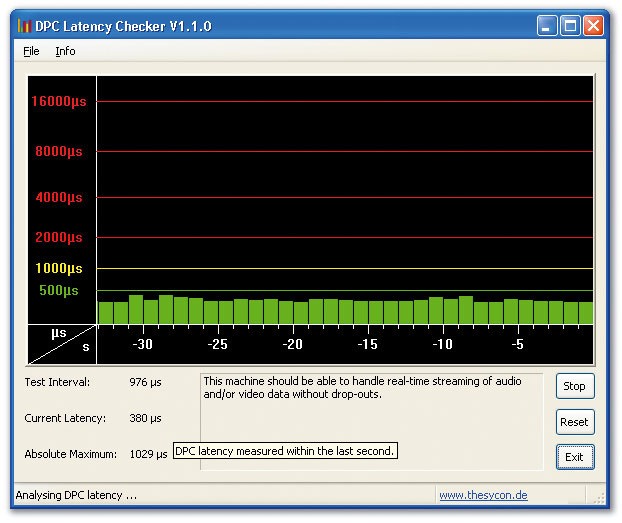 These DPC Latency results from an SOS forum user illustrate how enabling Wi-fi on a laptop PC can cripple audio performance. 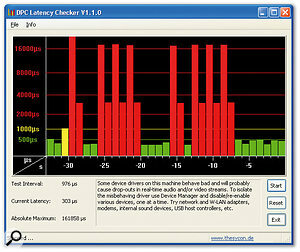 Tracking down the possible causes of audio clicks and pops can be a thankless and frustrating task, so I was pleased last month to be able to recommend an easy-to-use utility for highlighting the presence of any rogue hardware device that occasionally takes more than its fair share of interrupt time (a classic cause of audio interruptions). .php?Cat=&Number=588140) and encouraged readers to submit their findings. In just three weeks the survey attracted over 100 posts and 4000 views, and there's already a lot to take in. Let's summarise the results so far. DPC Latency Checker takes one measurement each second, providing a readout of current latency (which, on most PCs, is a relatively constant figure) plus the absolute maximum value recorded since you first launched the utility, which may occasionally spike to a considerably higher value on some systems, because of one specific hardware device. The reason for such spikes needs to be tracked down to avoid possible audio interruptions (especially if you're using small audio buffer sizes). I've found the most effective approach after discovering spikes is using Device Manager in real time: select a possible rogue device in its list, right-click on it and select the Disable option. If the spikes are unaltered, you then re-enable the device and move onto the next one, until you find the culprit. When you find it, possible cures include updating its drivers, disabling the device each time you want to make some music, or creating a dual-boot system with it permanently disabled. To get the ball rolling, I posted some baseline figures from my own well-behaved Intel Conroe E6600 2.4GHz dual-core PC running Windows XP with Service Pack 2, which typically measured 50 microseconds, with an occasional peak of up to 100 microseconds on my Internet-enabled partition. There was a smaller typical value of 24 microseconds, with an occasional peak up to 65 microseconds, for my music-only partition. A hardware device needs to hang on to the interrupt for longer than 500 microseconds to enter the borderline area for audio interruptions, but these results do demonstrate that a stripped down, music-only PC is more likely to manage small buffer sizes (and thus lower audio latency) without audio glitching. Following last month's revelation in PC Notes that Intel BIOS updates could significantly improve audio performance at low latency with quad-core and octo-core PCs, the SOS forum's 'HL' reported that his Gigabyte P35DS4 v1.1 motherboard had lots of audio timing problems and stuck notes running Cubase with BIOS versions F7 to F11, and DPC Latency Checker reported regular peaks of at least 695 microseconds. Downgrading to BIOS version F4 or F5 resulted in typical values of just 30 to 40 microseconds. Quite a few musicians have already discovered that disabling network adaptors (aka network cards, LAN adaptors or NICs), and particularly wireless (WLAN) versions, may cure audio clicks and pops, but DPC Latency Checker makes it far easier to spot possible symptoms early on. For instance, in this survey 'Phat Riffioso' discovered a regular peak of 405 microseconds every 15 seconds on his Asus P5WDH motherboard, which he traced to polling of an unused Ethernet port to check if any device had been plugged into it. The cure was either to disable the Ethernet port in Device Manager, or connect a device to it. 'Timo' also reduced his results from 100-440 typical and 550 maximum to 14-25 typical and 100 maximum just by disabling his onboard Realtek RTL8169/8110 Gigabit Ethernet, using Device Manager. Another interesting finding from Timo was that moving his wireless mouse doubled his lower results to 30-130 microseconds typical and 226 maximum. Back in PC Notes August 2006 I reported on the Cursor XP mouse-pointer enhancement utility from Stardock (www.stardock.com), which managed to stop one musician's audio every time he moved his mouse, and started it again immediately he stopped moving it. 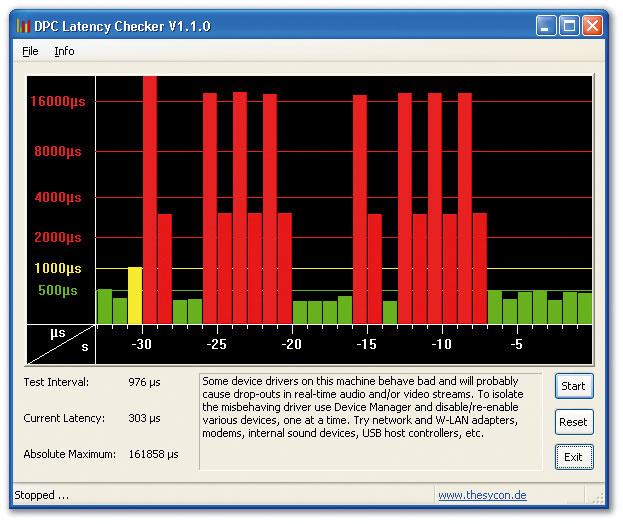 So if you're replacing a hard-wired keyboard or mouse with a wireless model, or installing custom mouse or keyboard drivers, I now recommend using DPC Latency Checker before and after to check for spikes, as well as making an image file of your Windows partition so that you can easily backtrack if necessary. A class-action lawsuit against Microsoft over the sale of PCs bearing 'Vista-capable' stickers has finally been approved to go forward by a US District Court judge, after customers were mistakenly encouraged to believe that PCs they bought during the Christmas 2006 holiday period could be easily upgraded to Vista when it shipped a month later. In fact, these PCs would only perform well with Vista Home Basic, which lacks many features, including the Aero Glass interface, Flip3D window switcher and Media Center. However, of more general interest is a 158-page bundle of associated internal Microsoft emails that the same judge has recently been ordered unsealed as part of this case. These include reports that almost 30 percent of all early Microsoft Vista crashes logged by Microsoft were caused by Nvidia drivers. Microsoft themselves were in second place with nearly 18 percent. Most of these driver issues have since been solved, but this information once again underlines how driver performance can bring an operating system to its knees. Other sobering figures for Vista can be found among the results of a recently published report from Forrester Research (www.forrester.com) covering 50,000 users across more than 2300 large enterprises, which indicate that during 2007 Windows XP was still being used by around 90 percent of businesses, with just 6.3 percent of users moving over to Vista, while Mac users have risen from 1.2 to 4.2 percent during the same period. With Windows 7 rumoured to have a release date in the second half of 2009, many businesses may already be considering bypassing Vista altogether. 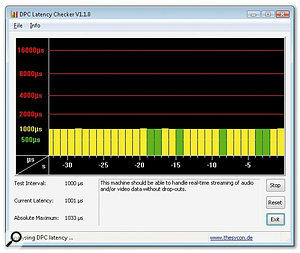 'Lachris' reported high average values of 200 microseconds on his Dell Precision M6300 notebook, with peaks of up to 2000 every 15 seconds, resulting in regular audio drop-outs, even at low CPU loads and with high buffer-size settings. These figures were subsequently confirmed by Dell on this model and their Latitude D630, and so far the only cure seems to be to buy a different laptop! 'Nuno' managed to get some good figures for his Dell notebook, but only after installing and configuring the third-party i8kfanGUI utility (www.diefer.de/i8kfan/index.html), which lets owners of certain Dell Inspiron, Latitude, Precision and Smartstep notebook models take manual control of their cooling fans to prevent real-time changes that cause audio drop-outs. Changes in fan rotation speed or CPU clock speed can prove an audio nightmare with some computer models (mostly notebooks). He also reported bad audio glitching on his particular notebook after installing M-Audio's Midisport 8x8 MIDI interface drivers, which was only resolved after a reformat and clean install of Windows. Another forum user posted these figures showing the huge difference in DPC Latency between his Dell E520 desktop PC running Windows Vista and running XP.Once again, the moral is that before you install any new hardware drivers you should make a disk image file, run DPC Latency Checker for a few seconds to gauge its typical and peak results, then install your new hardware and check that the results haven't got significantly worse. If they have, and you're sure you have the latest drivers, at least you can restore the image. Continuing with Dell-related submissions, 'danf' posted the results from his Dell XPS M1330 notebook running Windows Vista (typical 100/200, but occasional spikes to 1000+). He managed to reduce these figures to between 60 and 70, with occasional spikes to 220, simply by installing Windows XP instead. Danny Bullo got an even bigger improvement with his HP Pavilion dv9500t laptop, which gave spikes of up to 3000 microseconds with Vista, but a very low 50-microsecond peak with XP! 'Muied Lumens' then switched to XP after a year of tweaking Vista, reducing almost continuous 1000-microsecond readings to a mere 12-15, with peaks of just 100 microseconds. While we can't actually conclude that Windows Vista itself is to blame for all these high readings (hardware drivers and, in particular, graphics-device drivers are currently under suspicion) the fact remains that by switching to Windows XP these three musicians solved their audio problems. Perhaps Vista performance will simply leap ahead when more optimised hardware drivers have been developed for certain rogue devices. DPC Latency Checker may also help us identify problems caused by rogue Firewire controller chips and badly written audio interface drivers, so please report anything unusual you find!